My Twitter feed is mostly populated with data-related resources and people, so I almost always find something new and shiny going on there to distract me. Sometimes this can be a good thing though (and sometimes, it can be the best thing ever). 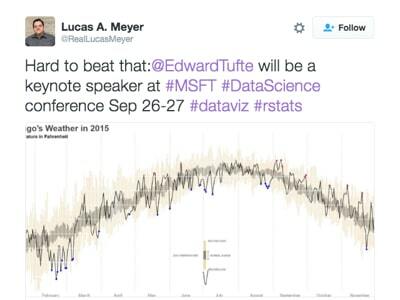 What caught my eye was not the actual tweet, but the sumptuous weather visualization that I recognized as one of Edward Tufte’s famous creations. I clicked through to the article, which linked to Tufte’s original chart (here) and a fantastic tutorial about re-creating the chart using R, from Brad Boehmke (which is actually the chart shown in the tweet above). It looks at daily average temperature over a period of time and captures the historic min/max range, the normal range (95% confidence interval), the 2014 temperature line and picks out the highs and lows. It renders all of this information in a single, beautiful column/line combination chart. Curiousity piqued, I wondered whether this would be possible with Google Sheets? …no, well maybe, ok yes, but not with Google Sheets alone (we need the Chart API too). You can create something bearing a resemblance in Google Sheets only, but with significant shortcomings as I’ll discuss below. 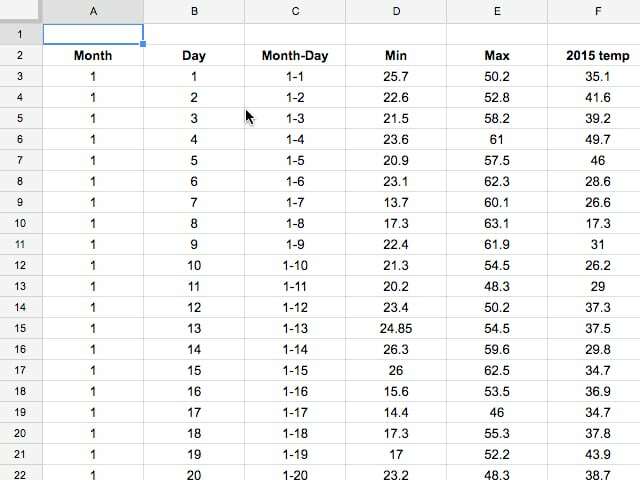 Google Sheets implementation of the famous Tufte temperature chart. More than a passing resemblance to the original but still significant shortcomings. 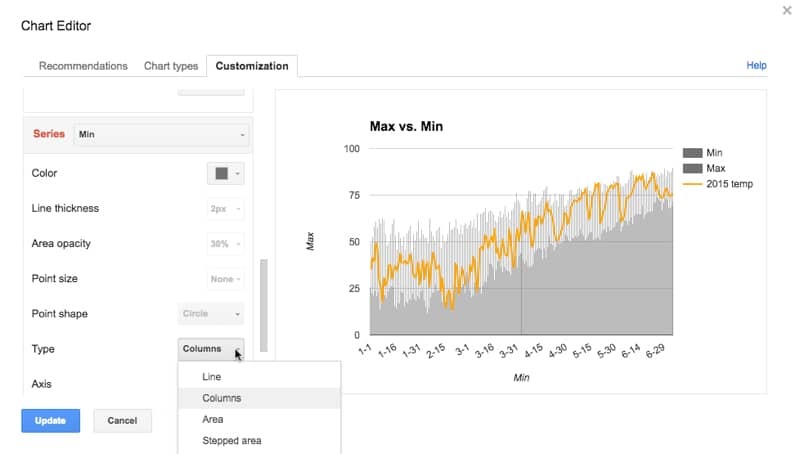 Google Chart API version of Tufte temperature chart, a much closer match. Here’s this same chart live on my site. 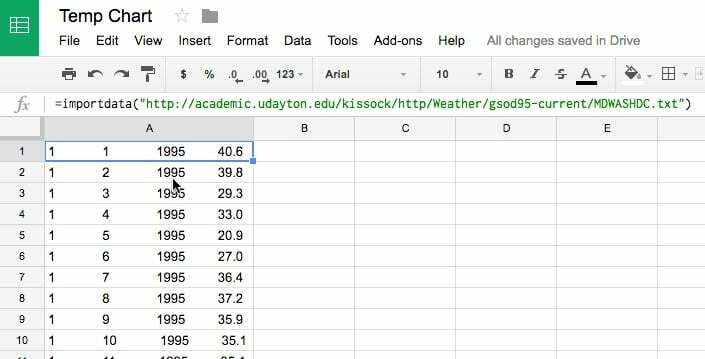 The University of Dayton has archived a dataset for each city as a .txt file of average daily temperatures. Find the city you’re interested in (I’m using Washington D.C. in this example) and click the link to open the text file. Unfortunately, the data is all imported into a single column, so we need to do some data cleaning before it’s ready. 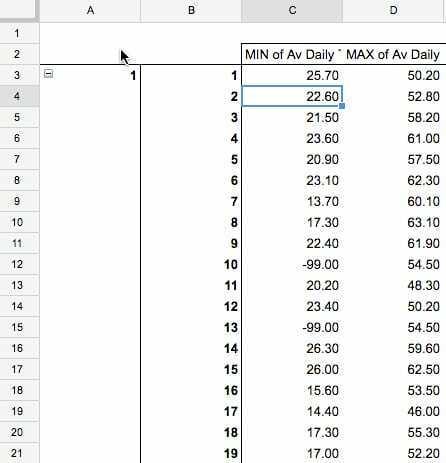 What we’ll do is use Text-To-Columns (now available in Google Sheets) to split the data into columns, splitting the data by spaces. However there’s currently a uneven number of spaces which means the data won’t line up nicely into columns. Then copy this new column, and then text-to-columns with the space delimiter and you’ll have your cleaned data ready. Easy! Presently the data is in a tall format (great for databases and Tableau) whereas we need a wide, table format for this chart. Read more about the shape of data in this excellent article from Robert Kosara. To do this we need to use a pivot table. This gives us our historic temperature range, with a min and max temperature for each day of the year. Why not set the Min to white? Try it, and you’ll see that the max extends all the way to the x-axis and you’re back to square one. Ok, so why not use a stacked column chart? Because you can’t in a combination chart! Don’t fret, there is another way! Not a huge deal to do here, but since we can use a stacked column chart in this case we need to set that up. Create a new column called Historic Range that is simply the Max minus the Min, which we’ll use as our series 2. This represents the record low and high average daily temperatures in the past 20 years. Also, create two new columns called 2015 Record Lows and 2015 Record Highs, which we’ll use to mark when the 2015 series line corresponds to the minimum or maximum temperature in the range. Here’s a link to the Washington, D.C. dataset if you want. A lot of this code is boilerplate from the Google Chart API examples. The Google corechart package is loaded on line 5. On line 16 I specify the URL of my Google Sheet (which needs to be shared with editing access*). Line 14 specifies which columns I want to select from my Google Sheet. A blank Data Table is setup in lines 28 – 34. The raw data from my Google Sheet is added in line 36. On line 37 I specify a new combo chart to be added to the chart_div element of my webpage. they’re set to white and have the interactivity disabled, so that no tooltip or highlighting will show up when I hover over them with the mouse. Finally on line 60, I draw the chart with the raw data, based on all the settings in my options object. * Need to get the Google Sheet link with editing rights, otherwise you’ll get an error and need to setup authorization… read more. You should be able to drag and drop this local file into your browser and see the chart open up. Voila! 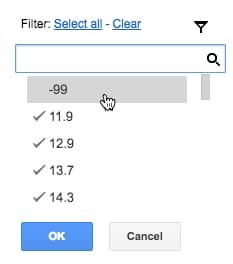 Adding confidence bands: To add the normal range, simply add additional series to the Google Sheet representing the normal range (the confidence band) and then add them to the Chart code above. In the pivot table, add columns for mean, standard deviation and a count of the number of records for each day. Then use the confidence formula to calculate a confidence interval. Here’s the updated Google Sheet data table and the new code on Github. I’ll leave it for you to experiment with them. Here’s the full code on Github, including the confidence bands and overlays. Don’t forget to insert your Google Sheet link where I have the comment “Put your own Google Sheet sharing URL here, with editing enabled”. Here’s the link to the actual chart on my website. If you liked this post then you may enjoy my follow-up where I re-create another classic chart using Google Sheets and the Google Visualization API – this time an animated temperature visualization. Awesome! I’ve been meaning to add something like this to all the phenology data I have from native plants blooming/fruiting/etc. I’ll check out the raw data… any rainfall numbers? Unfortunately I don’t have any rainfall data, but I’m sure it’ll be out there somewhere. 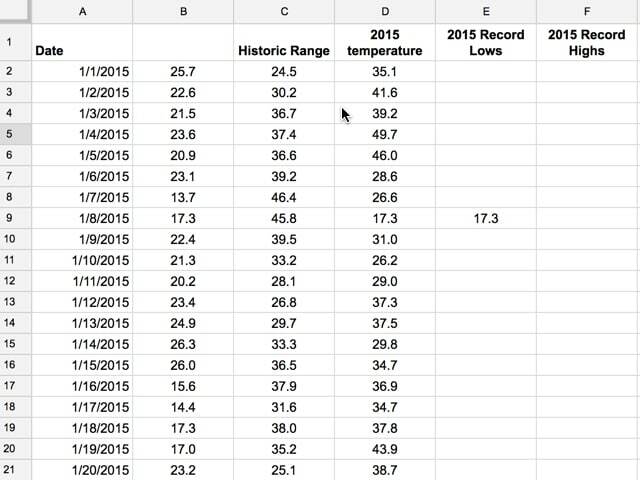 I found the DC temperature dataset used here through Google search. I did a follow up article on a dynamic chart with this same dataset. Say, how did you propagate the trim formula to the cells? I see the control + down for the dataset. Hi. I’m having a hard time replicating this exercise. Where should I copy this code into? In Google Sheets script editor I tried pasting it into a html file and a script file but it seems I’m doing something wrong. Could you explain the correct way to do it?